Love Just Gets Better with Age! Marketers target their Valentine’s Day message to a younger audience of romantic new loves, first dates, and newlyweds. Although the Valentine’s advertising blitz may overlook the elderly, married couple demographic, it doesn’t mean this isn’t a significant holiday for mature lovebirds and the wisdom they have to share. So plan something special for your sweetheart, or for your parents to celebrate the love, faith, and patience that has held their love together for all these years. You are never too old to be in love! A family to share. Many loving couples will have children, grandchildren, and perhaps even great-grandchildren to enjoy. Having this shared close connection to family is a wonderful way for seniors to stay connected and current through their interactions with the younger generation. They can take part in the joy of seeing their children as parents and observing how much the world has changed since they were young And often, they can share sage advice with family members based on the experiences in their long lives. Anniversaries have new meaning. 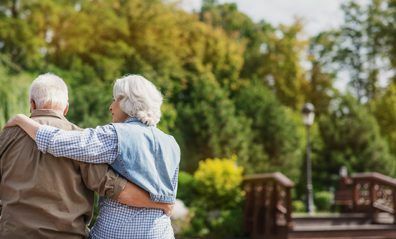 With the passage of time, anniversaries for an elderly couple can take on a special importance and continue to fulfill the promise they made to each other. This marked passage of time and their relationship wisdom should be cherished. Make each anniversary count with a celebration, a special dinner, a short trip, or the perfect gift. Enduring the tough times and investing in a long-term relationship should be celebrated. Free time to spend together. After juggling the demands of a busy home, full-time jobs, raising children, house maintenance, and short weekends, many couples can now fully enjoy quality time together after retirement. They have the time to plan vacations, indulge in their hobbies, and focus on each other. There may be no other time in our lives that can be as indulgent as when your time is your own. Feel younger together. When you look into the eyes of the one you love, the years will melt away. She will see his boyhood charm beyond the gray hair, and he will look past her wrinkles. This may be the one person able to tap into the youthful vibrancy of when you first met. Try to rekindle a shared moment from when you were newlyweds or if you are a caregiver, help recreate a special moment–a first date, romantic picnic, or favorite vacation. Aegis Living would like to wish all lovebirds, no matter their age, love that endures the test of time and that the years only add joy to your experience and life together. Happy Valentine’s Day!